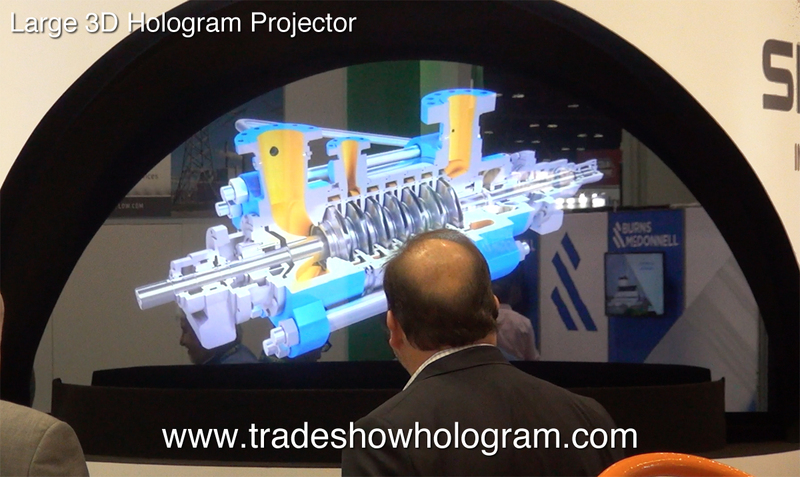 Large scale interactive Hologram Projector exhibited at Power Gen International 2016 in Orlando. Visitors to the SPX FLOW booth at PGI 2016 interacted with floating 3D presentations describing various highlights of their products. The 3d hologram projector attracted a lot of attention to the booth as well as multiple leads. In todays busy trade show environment it is important to stand out from the competition in attracting attention to your booth space. This large scale projector creates stunning visuals in full color with an audio sound track for narration. Images projected are up to 33 inches tall and almost 5 feet wide. The objects appear to be floating in mid air and no special 3D glasses are required to see the special 3D effect. Trade Show Holograms, the company that offers the projection displays for sale and rent across the United States and Canada developed their new ultra bright system in early 2016 which allows for the larger version to work in bright trade show environments. The new interactive feature allows a viewer to call up any of the programmed holographic presentations with the touch of a finger via the interactive touch screen. Large Hologram Projector exhibited in Orlando.